I’m jumping right into challenge hosting next year, and adding a second challenge to my blog, that way there is a challenge to match each of my two focuses. 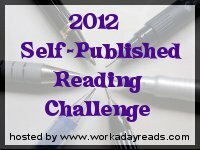 I have an ebook challenge, so naturally I needed to add a Self-Published Reading Challenge. I love reading self-published stories, and love sharing them with others as well. With the huge surge in available books this year, I thought this challenge would be a great way ride that wave into next year. This challenge will run from Jan 1, 2012 – Dec 31, 2012. I love the idea of promoting Indie writers. I would like to sign up for the paragraph level. I do not have a blog so I will need to report my status in the comments section. This is such an awesome idea and I'm for sure going to do it. As a self published author myself I know how hard it is to get people to read something unknown. Keep up the good work. This is a great idea, Sarah! Thanks so much for hosting! I'm going to join you in this challenge as well! What a terrific challenge! It will be good to get my sight back on some good self published books and a great way to keep me motivated. Thank you for hosting. That's a great side benefit that I didn't even think of. I love discovering new authors and look forward to this challenge. I'm starting off at the Paragraph level but will see how it goes. I'm in! It sounds like fun – lately I've been reading quite a few indie authors. I'd like to join as well as I think Indie books needs more hype and some of them are really good! I'll be joining this challenge. I'll put my post up next week! I have a commitment to only reading Indies on my Nook. Thanks for hosting this — I'm super excited to join this challenge. I am SO grateful you are sponsoring this Challenge! Thank you! I am going to go for the Chapter – 50 Books! I have also joined the Ebook challenge as well, 50 – Hard Disk! I like the idea of this challenge! Two of the best books I've read,Voted Most Creative and ReRambled Food and Thought(which I'm rereading this year!) were self published. I also really enjoyed The Universe is Inviting You In which was self published as well. I'm signed up for 7 challenges right now so I'll have to think about it a little longer before I can commit to another one! Great idea. I'm doing the novel but I may upgrade to the book later in the year if I pick up some steam. Cheers! Do small press books count? a all round entertaining blog (I also love the theme/design), I don’t have time to look over it all at the moment but I have bookmarked it and also added in your RSS feeds, so when I have time I will be back to read more, Please do keep up the excellent job.